Apple on Tuesday expanded its "your verse" iPad media campaign by adding a second story to its dedicated mini site, this time highlighting the tablet's use in professional mountain climbing. 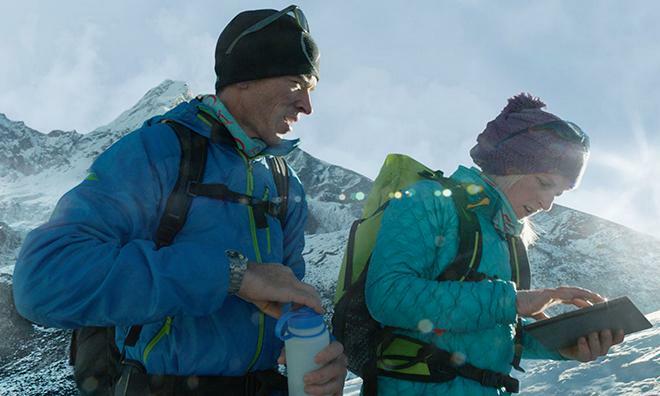 Following up on the underwater exploration vignette that launched alongside the "your verse" TV ad, Apple's latest post shows how mountaineers Adrian Ballinger and Emily Harrington use the iPad to navigate the world's highest peaks. In exploring frigid and unforgiving altitudes that most humans visit only in the comfort of a pressurized jet cabin, one piece of equipment has become essential to them: their iPad. Apple explains the duo uses the iPad and the Gaia GPS topography app to map out climbs, study terrain, plot routes and decide where to camp. "Five years ago, it was hard to even get a paper map of these places," Ballinger said. "Now with the iPad it's remarkable how much we can plan ahead." Ballinger and Harrington also use their iPad's communications capabilities to blog, post photos and connect with people via social media. This real-time story telling would be next to impossible without the iPad. In addition, the iPad's GPS functionality helps to "chronicle," or verify, a climb for government agencies and mountaineering organizations. In a routine climb, the iPad is used in almost every stage of ascent, from setting up base camp to reaching the summit. As the route progresses, available oxygen levels decrease, meaning tools and equipment must be continuously pared down along the way until only the essentials are being toted. The iPad is included in the pack used to summit the mountain and, aside from a radio, is the only electronic device that makes it to the top. With the iPad, the pair's expeditions have been made a bit safer, allowing them to try new routes and explore more remote places, Ballinger said.